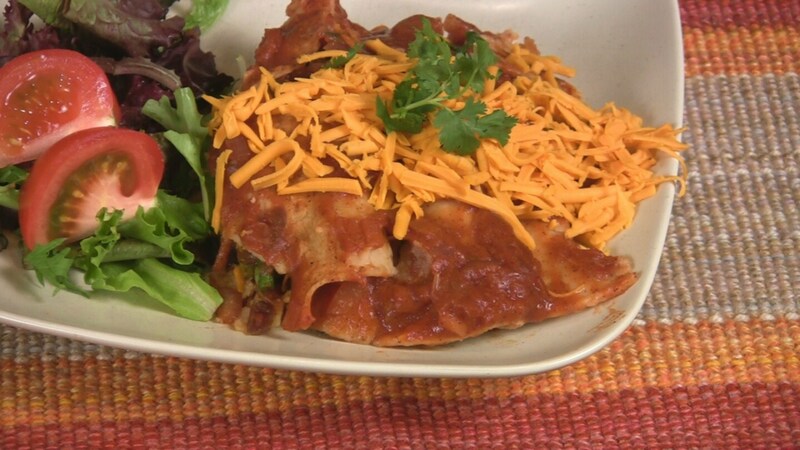 Enchiladas are a wonderful combination of corn tortillas that are stuffed with an assortment of fillings, smothered in a spicy tomato sauce and baked. Wrap the tortillas in the foil and place in the oven. Dice the onion, slice the mushrooms, mince the garlic, remove the tough ends off the asparagus and chop into 1 inch pieces. Warm the oil in the pan and add the onion, garlic and mushroom. Cook on low until soft and aromatic. Add the asparagus and cook for 1 minute. While the vegetables are cooking, grate the carrot and cheese and dice the zucchini. Add the sauteed veggies to a bowl and add carrot and zucchini. Mix in the spices and the jalapenos, if using. Remove the tortillas from the oven and increase the oven temperature to 350 degrees. Set up your counter top with the warm tortillas, a 9 x 13 baking pan, the grated "cheese," the enchilada sauce and the filling. Take one tortilla and place it in the pan. Using a ladle or a spoon, put 2-3 tsp of sauce down the middle of the tortilla. Add 3-4 tablespoons of filling. Sprinkle some "cheese" on top. Roll the tortilla and place the seam side down in the pan. Continue until all 12 tortillas are filled. Smother the enchiladas with the rest of the sauce, making sure all of the corners and edges are covered. If you have extra "cheese," you can sprinkle it on top. Place into the oven and bake for 30-40 minutes, or until the sauce is bubbling. Accompany your enchiladas with a green salad, beans, rice, guacamole and tofu sour cream. Other filling options include: diced yellow squash, cooked rice, potatoes (boil until cooked and dice), spinach (steamed, squeezed dry and chopped), bell pepper, black or pinto beans, tofu. To reduce the probability of torn tortillas, heat them in a skillet with a light spritz of oil instead of warming in the oven.